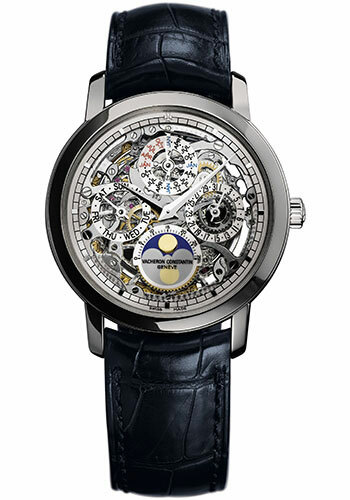 39mm platinum case, openworked dial, self-winding 1120 QPSQ movement with hours, minutes, perpetual calendar, moon phase, approximately 40 hours of power reserve, dark blue strap with platinum classic buckle. Water resistant to 30 meters. 39mm 18K 5N pink gold case, transparent back, openworked dial, self-winding 1120 QPSQ movement with hours, minutes, perpetual calendar, moon phase, approximately 40 hours of power reserve, Mississippi alligator strap. Water resistant to 30 meters.